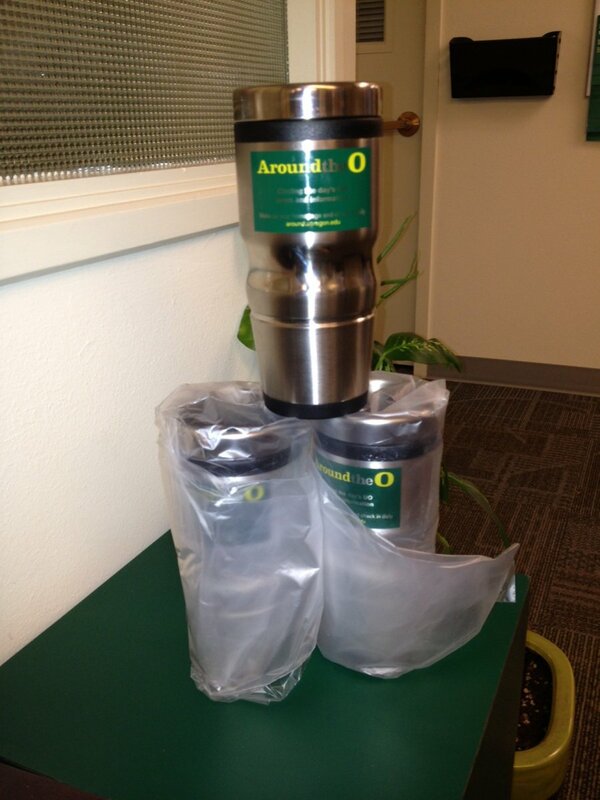 Ten more stainless steel AroundtheO travel mugs found homes when 10 careful readers of AroundtheO had their numbers drawn in today's scavenger hunt contest. Each winner submitted one or more correct answers in this week's daily contests to become eligible for the weekly drawing. This week's winners are: Keisha Janney of the Office of Multicultural Academic Excellence; Laura Johnson, Prospect Management & Analytics; Debbie Anders, University Development; Charles Powell, Sponsored Projects Services; Krystal Sundstrom, Applied Second Language Studies; Kata Bahnsen-Reinhardt, Law School; Jaye Barlous, UO Libraries; Nancy Novitski, Political Science; Susan Stumpf, Admissions; and Deb Pack, UOPD. Five major prizes have been awarded in the contest, which began in November. Laura Lacasa of the Financial Aid and Scholarships Office, Charlotte Wise of the UO's Neuroinformatics Center and Joyce Nims of the College of Education have each won $100 gift cards to The Duck Store; and Amy Lake, who works in the UO Libraries warehouse, and Marge Wise of the UO's Early Childhood CARES program, each won iPads. The contest, co-sponsored by The Duck Store, is part of a launch promotion for AroundtheO – the UO's new website for faculty and staff news. It is intended to remind you to make AroundtheO your homepage – and your go-to source for UO news and information. The contest will continue for at least the next few weeks, with several stainless steel AroundtheO travel mugs given away each Friday. Ten people will win mugs in next week's contest. The AroundtheO scavenger hunt rewards careful reading – each daily question has its answer somewhere in the text of the five stories most recently posted to AroundtheO. The questions are posted on the AroundtheO Twitter feed each morning. The feed (https://twitter.com/aroundO), can also be viewed in the right-hand column of the AroundtheO website.